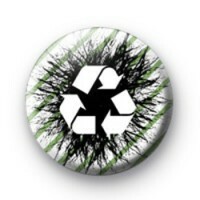 Recycling Logo Badge in black, white & green with a white three arrows recycling logo on it. Be Smart Be Green. Save our Planet. Environmental pin badge, perfect to teach kids about recycling. Standard 25mm button badge made by hand in our UK workshop.